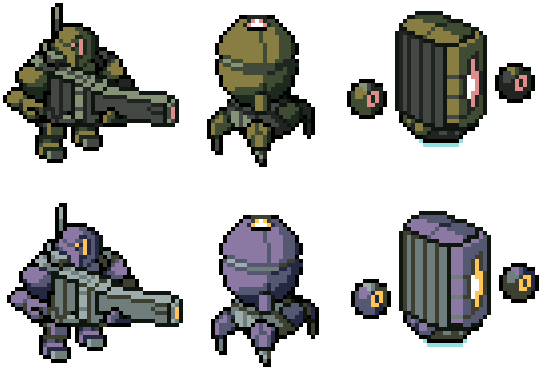 Several iterations of the Whirlpool Mech! The Whirlpool Mech actually gave me a lot of trouble - I liked the concept, but it didn't really... work? For one thing, it was an Artillery Mech, which the last design didn't convey at all. So I tried a few different ideas. And finally, we're left with these concepts. I still haven't put them ingame, but at least they're sprited up! And I also am considering making my own Squad - another, different one from Mr. Reaper up there - and came up with this fellow and his two friends. New squad! Worked on neozoid's Neo-Machina! Concepts! I don't know if the gun is big enough. 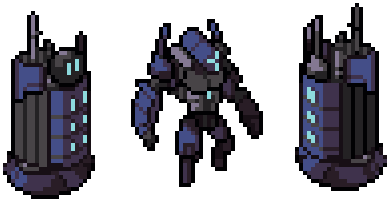 Got them ingame and played around with them... and realised the Ion Mech (the orb guy) was actually a flier! Oops! Small tweaks, and now they're done. Working on a crazy concept, a whole other army of plant-based Vek (in this timeline they're plants instead of bugs, okay? Chaos theory! ), but before that I made a concept for a super powerful single mech with two retainers that can basically only support the primary. The buildings can grant the big guy another action, and can be upgraded to grant additional bonuses alongside it. Just, you know, added to the enormous pile of ideas. Djinn wrote: New squad! Worked on neozoid's Neo-Machina! 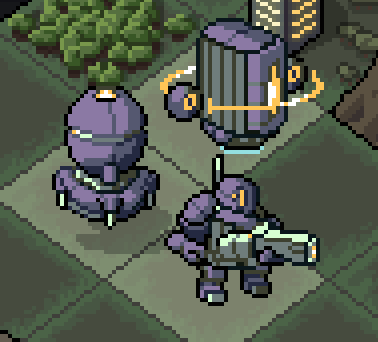 I mentioned earlier a squad in which there's one active mech and two support mechs that can grant it extra turns. I still don't know how to CODE that, but I have the sprites ingame atleast! Surely it can't be THAT hard! Right? Hey, Djinn, I have been enjoying playing Arfy's and others' mod squads that you have contributed spritework to. Awesome stuff. One thing, though, I am having trouble with your link for the Riptide squad. It states that The archive is either in unknown format or damaged. 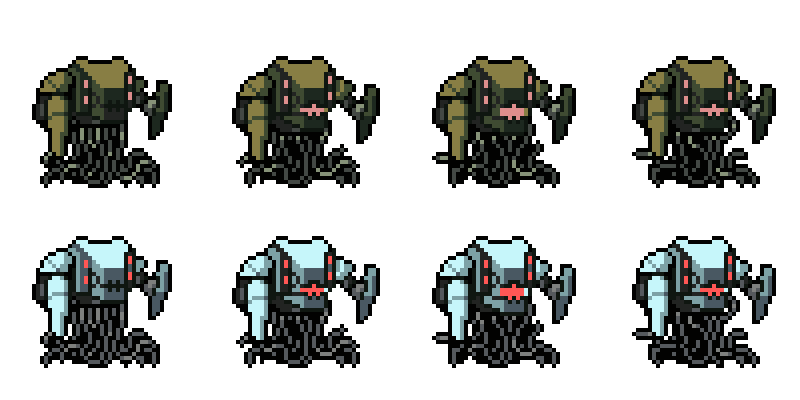 I really want to play this squad but I prefer to use your sprites for that original look and feel. Robert Scythe wrote: Hey, Djinn, I have been enjoying playing Arfy's and others' mod squads that you have contributed spritework to. Awesome stuff. One thing, though, I am having trouble with your link for the Riptide squad. It states that The archive is either in unknown format or damaged. I really want to play this squad but I prefer to use your sprites for that original look and feel.